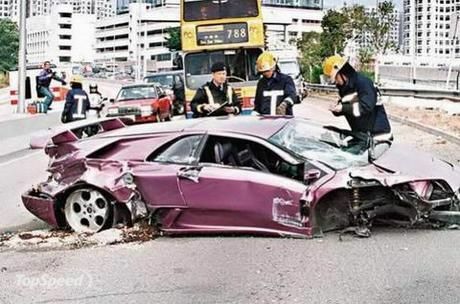 We didn’t have news about a Lamborghini crashed for quite a while now, and we were happy, you thought that maybe the other ones were just bad luck. But well now, another one is gone. What you see in this images used to be a Lamborghini Diablo SE30 Jota owned by Jay Kay, leader of the group Jamiroquai. This is how the car was looking after the "Cosmic girl" clip was made. Jay Kay decided to "make a turn" and well, the result you can see it. Jay Kay is a regular participant of GumBall Challenge and he also owns a Miura, one Enzo and a Mercedes 600, so he won’t miss his Diablo which now rusts in an English garage.